"Of the journey back I have but a dim and feverish recollection. I remember that my feet got worse instead of better, that when the wretched shoes were beyond even tying together with vines, I cast them away, and bandaged the feet with what remained of my shirt. That on the second and third day of our journey we had not even a little bird to eat, but plunged forward in a stupid apathy of hunger and pain. The upper Dja river, a remote area in west central Africa. Paul Du Chaillu in London, 1860s. Courtesy of National Portrait Gallery, London. “Remandji put the kendo over my shoulder, which gave me like power with himself. It was done in the presence of an immense crowd, who shouted out their approval, and promised to obey me. GIF image by Connor Bell used with permission. 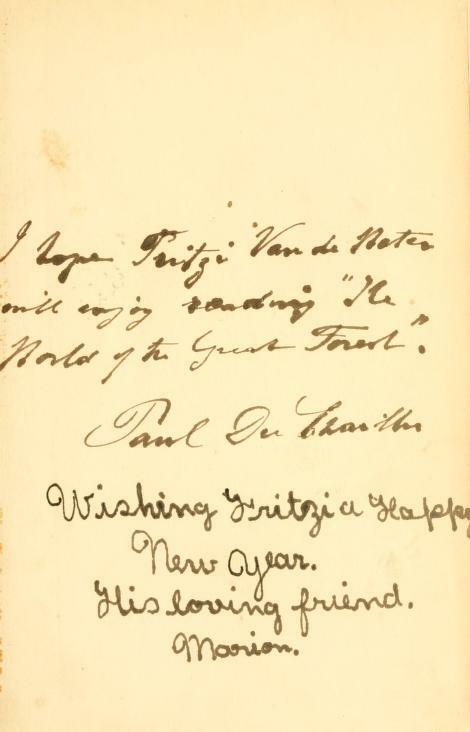 Above: an inscription by Paul Du Chaillu found in his book "The World of the Great Forest" (1900). The inscription underneath is from a friend. Image: Scottish explorer Mungo Park (1771-1806) explored West Africa during several expeditions up the Niger River. After one perilous thousand-mile journey (1,600 km) he and his party drowned in the Niger during a cannibal attack in 1806. A dull grey cobra, about five feet long, crawled from beneath the table... There was no time to lose; Mr Talbot seized a tent-pole and struck the snake, but an unpliable stick is a dangerous implement. The cobra reared up and spat venom straight into his eyes. The pole came down on it once more and broke its back, but already Mr Talbot was in intolerable agony. Henry Morton Stanley explored the middle reaches of the Congo river and founded the city of Kinshasa in 1881. Here he is on the frontispiece to Volume 1 of his In Darkest Africa (1890). This country had never before been visited by a white man... Upon landing, we were immediately surrounded by a surging crowd of evil-smelling ruffians, to the exclusion of all fresh air. I paid a heavy penalty indeed for the unique position of being their first white visitor; I was buffeted to and fro, while large grimy hands mauled me over as if to prove, by sense of touch, the reality of my strange appearance. My patience was sorely exercised, and the climax of my misery was reached when, after bland and eloquent speeches on the part of the chief and his henchmen, I submitted to the ceremony of blood-brotherhood with Ozoio, the Mubunga chief. An incision was made in both our right arms, and our blood was collected and mixed in a broad leaf. This leaf was subsequently rolled after the manner of a cigar, cut into two portions and handed to us to eat. This trying ceremony, the traditional evidence of good faith, was accomplished with the accompaniment of shouts and a furious uproar of drum-beating. “The whole wide country seemed to be given up to cannibalism, from the Mobangi (a major tributary of the Congo) to Stanley Falls, for six hundred miles on both sides of the main river, and the Mobangi as well. Often did the natives beg Grenfell to sell some of his steamer hands, especially his coast people; coming from the shore of the great salt sea, they must be very ‘sweet’ – salt is spoken of as sweet, in the same way as sugar. They offered two or three of their women for one of those coast men. The son of Matabwiki, chief of Liboko, when asked whether he ever ate human flesh, said: ‘Ah! I wish that I could eat everybody on earth!’ Happily his stomach and arm were not equal to the carrying out of his fiendish will. George Grenfell (1849-1906) was a missionary and explorer from Cornwall, England. 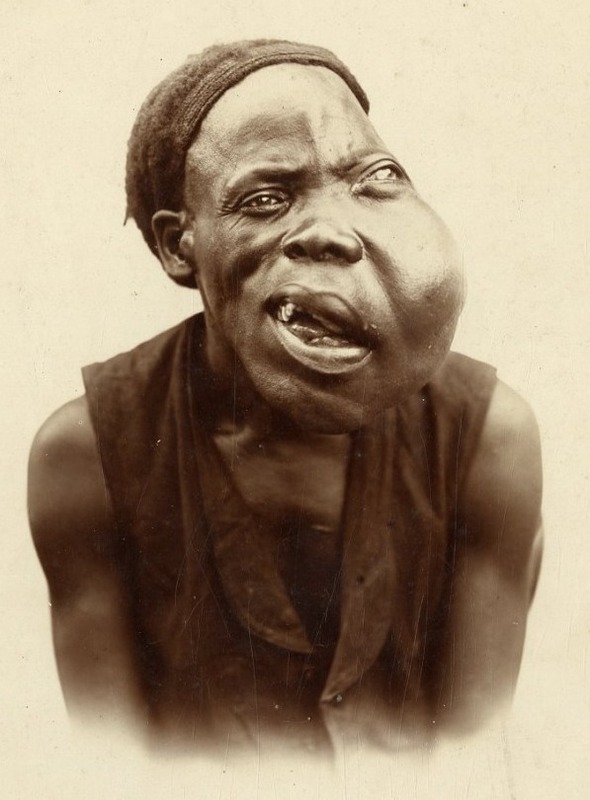 His steamship Peace explored the Cameroons and Congo, discovering unknown rivers and areas. Above: in boats like the "Goodwill", missionary George Grenfell explored the Congo river wilderness in the 1880s. “There were moments when one’s past came back to one...but it came in the shape of an unrestful and noisy dream, remembered with wonder amongst the overwhelming realities of this strange world of plants, and water, and silence. 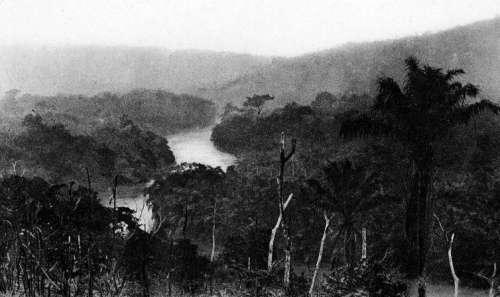 The Congo river near Lefubu, 1888. Photo by Alexandre Delcommune. Above: the Opobo river in southern Nigeria, in Rivers State. I had such a ‘gouamba’ — that is, such a longing for meat — that the nuts and the boiled antelope skin became loathsome to me... What a fearsome meaning there is, I thought, ‘In that native word “gouamba”!’ I spent hours in a sort of waking dream in which I fancied that I had returned home, and had met many friends, one after another, as I walked about the streets. I could see the smoke rising from these hot dishes. How I enjoyed the pudding and the ice cream at the end of the dinner! A Belgian river station on the Congo river, Belgian Congo. Above: Duke Adolf Friedrich of Mecklenburg. Lieutenant Dr. Arnold Schultze, officer and entomologist on the Mecklenburg-Schwerin expedition of 1907-08. Okapi skins in the Semliki Valley photographed by the Mecklenburg-Schwerin Expedition of 1907/08. Above: skins and skulls found by Johnston attracted the interest of the American Museum of Natural History.